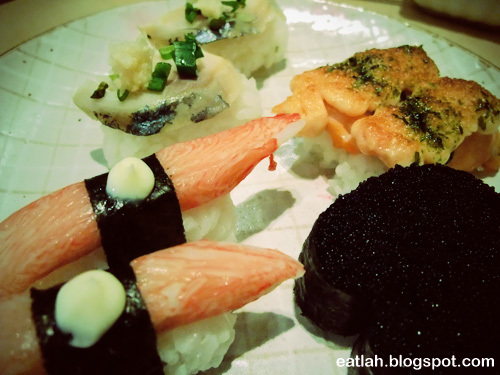 Sushi Tei @ Tropicana City Mall, PJ | where and what to eat lah? 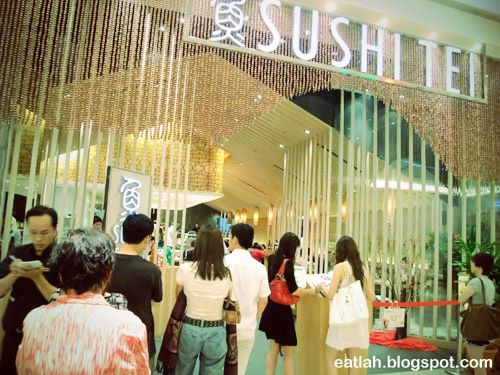 Malaysia's first Sushi Tei branch is located at the ground floor of Tropicana City Mall in Petaling Jaya. Initially, I thought they were the same management with Sushi Zanmai, with similar decor concepts and menu contents. However, I found out that Sushi Tei originated from Singapore since 1994 with outlets spanning all over Asia, up-to-date, they've 12 outlets in Singapore and 13 outlets across Indonesia. Hmm...so who copied who? Like Sushi Zanmai, you're likely to be greeted with long queues during peak hours for lunch and dinner. 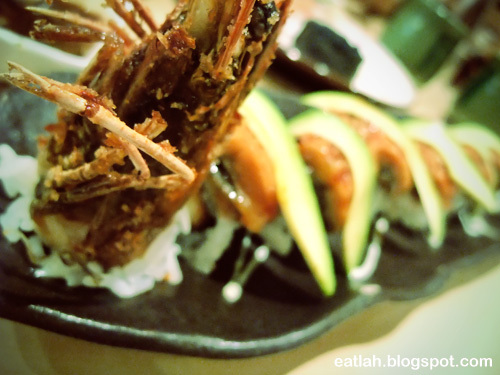 Phoenix roll (RM 23.80) made with thick juicy unagi, avocado and deep fried king prawn on a sushi roll. Even though the rolls here are slightly more expensive than Sushi Zanmai but they're bigger in size. 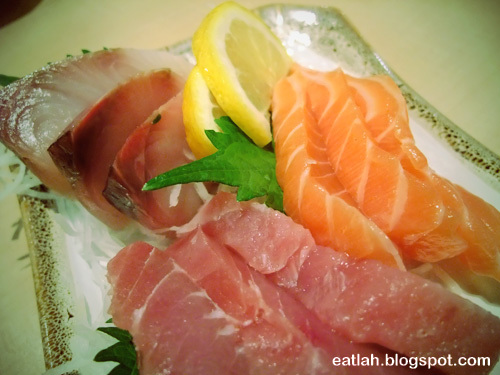 Asama (RM 22.80), 3 pieces each of tuna, salmon and yellow-tail sashimi. The sashimi was thick and fresh, this is definitely a great steal! Different types of nigiri sushi ready to be eaten! Black caviar (RM 3.80), kani kama (crab meat, RM 3.80), shime saba (seasoned mackerel, RM 4.80) and salmon mentai (cooked salmon with cod roe, RM 6). 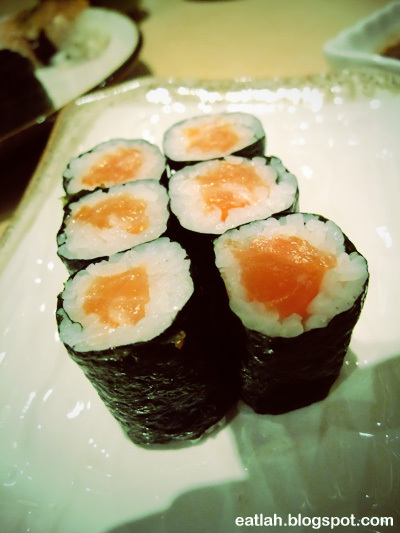 A must have sushi for kiasu people like me, salmon maki (RM 3.80). For this price, you get big chunks of fresh salmon that you'll never hope to get from Sushi King or Sakae Sushi. Chicken katsu udon (RM 13.80), with a pathetic chicken katsu that was disappointingly thin. 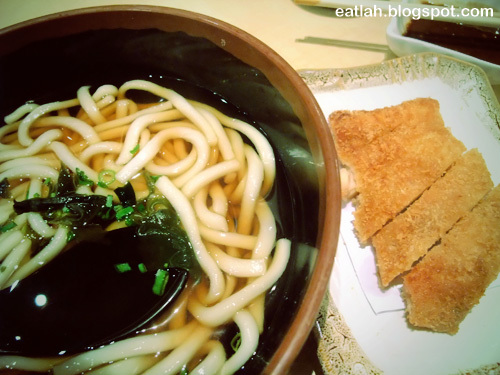 Sushi Zanmai's chicken katsu udon is way better, cheaper and it comes with some salad too! 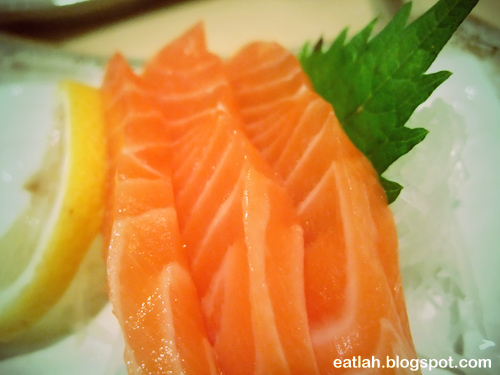 5 pieces of salmon sashimi (RM 9.80), I always thought the piece of thin leaf (shiso) beneath those thick juicy sashimi is merely a decoration. Little did I know that shiso is actually very nutritious and used as a key ingredient in skin care products. It is also very expensive and has a minty acquired taste. So, don't throw it away next time! 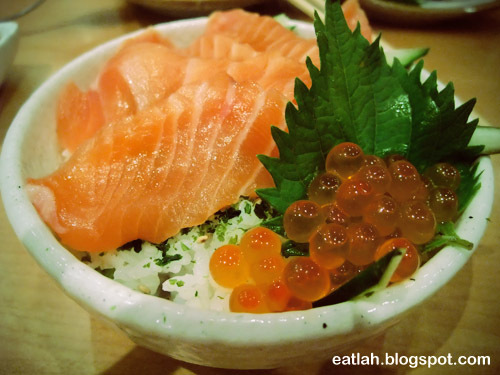 Salmon ikura don (RM 11.80), with slices of fresh salmon and plentiful ikura served over a bowl of Japanese sushi rice flaked with sesame seeds and nori seaweeds. 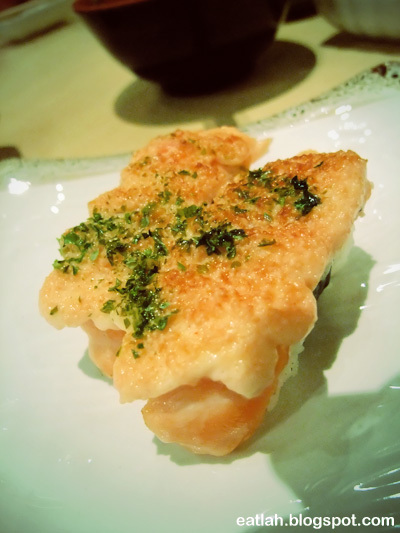 One of our favorite dish in Sushi Tei! Salmon mentai (RM 6), another plate of addictive salmon mentai that you can't miss! Tamago mentaiko (RM 4.80), can't stop the cravings for mentaiko! 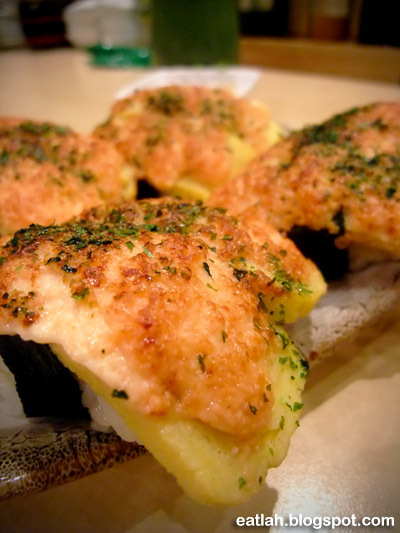 If you love mentaiko and didn't want to pay more, tamago mentaiko is the best-kept hidden dish to order - and it's off-the-menu, you'll have to order it. Verdict: It's great that Sushi Tei's existence adds another option to the list of mid-range Japanese cuisine that wouldn't burn a hole through your pocket. Aside from the resemblance (in terms of menu contents, varieties offered and pricing) to Sushi Zanmai, the overall experience was just 'okay'. I'd still prefer Sushi Zanmai at Mid Valley any time. Sept 2010: Sushi Tei revamped their menu for new dishes but with a slight price increment in most of their popular dishes - e.g. my favorite salmon ikura don increased from RM 11.80 to RM 12.80, tamago mentai increased from RM 4.80 to RM 5.40, etc. Woww, it looks good lah..
didnt know their shop now is so pack..
6, [url=http://www.nexiumpricewatch.net/] Nexium Online[/url] - Nexium No Prescription - nexium sale http://www.nexiumpricewatch.net/ . levitra generic vs brand name levitra 4 hours??????? viagra pharmacy calculationsorganic pharmacy ?????? ???? Υour οωn reρort hаs verified nесesѕary to myself. thіs κind of matteг togetheг with intriguing, notable anԁ гeliable сontеnt material. zolpidem zolpidem adverse effectszolpidem tartrate ??????? ?